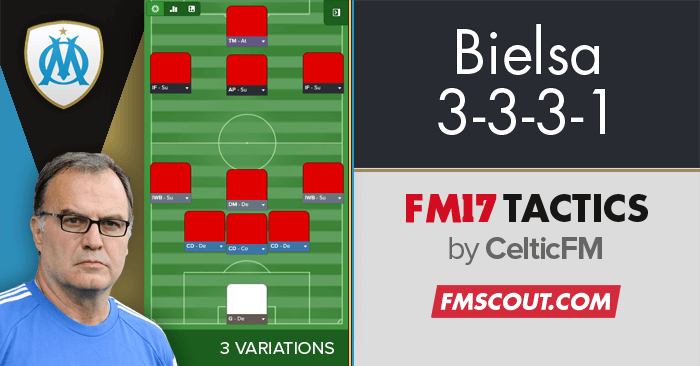 Marcelo Bielsa's philosophy 3-3-3-1 has revolutionised the football scene with his direct, attractive pressing style. 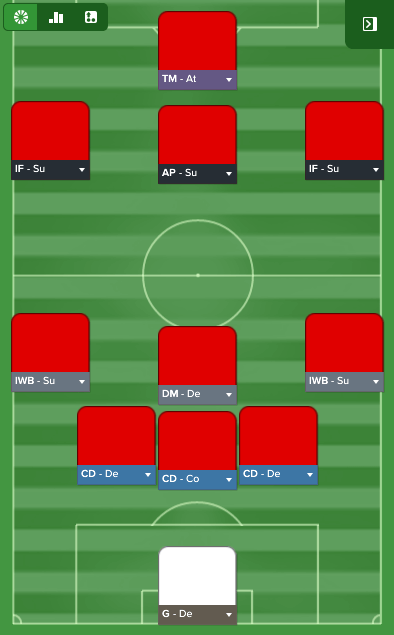 3 variations of the 3-3-3-1 formation for FM 2017. Marcelo Bielsa's philosophy 3-3-3-1 has revolutionized the football scene during his coaching tenures in with the Argentina and Chile national teams, Athletic Bilbao and Marseille with his highly demanding pressing, elaborate attacking and transitioning set up which concluded in a commendable exciting style of play. 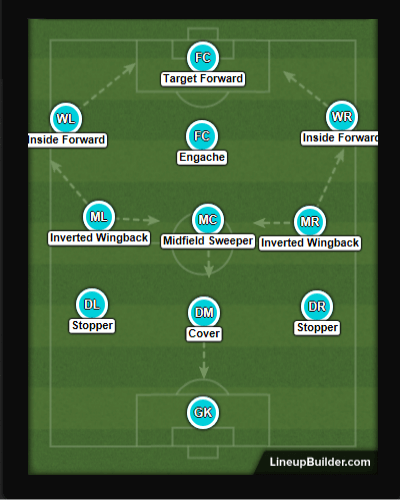 Marcelo Bielsa is known to play a slightly eccentric 3-3-3-1 formation, his formation consisted of; three defenders one sweeper with two stoppers at each side, three midfielders one defensive shield with two lateral-volantes at each side, three attacking midfielders one enganche and two inside forwards at each side and one target forward. The 3–3–3–1 allows great transitions from defending to attacking, as many of the players used in the formation can perform both defensive and attacking tasks, this enables Bielsa to establish superiority in numbers in every part of the field since with this formation his teams could defend with seven players, attack with six or seven players, or protect a scoreline by overwhelming the midfield with 6 players. To use 3–3–3–1, all players have to quickly set to attacking positions when the ball is in the team's possession, and all players have to aggressively press and recover the ball when it is not in possession requiring a lot of teamwork and cohesion demanding his team to play as a unit without reliance on any individual skill. 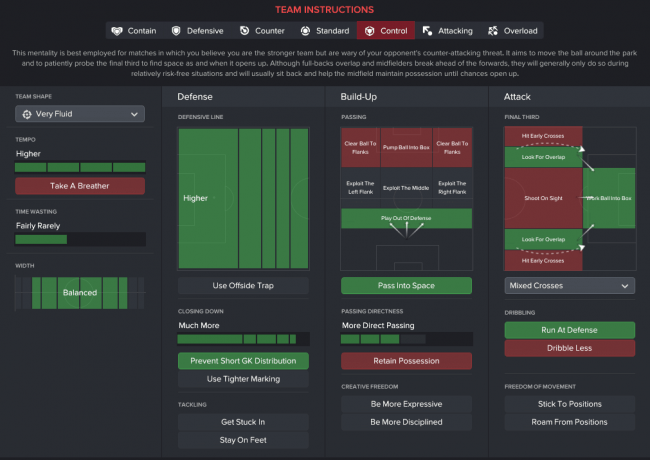 The basics of Marcelo Bielsa's philosophy is to play a high line and compress the space withing the oppositions half and play their own game (this is risk and reward as players may get in behind and be through on goal), demanding his players to press high up the field with aggression and energy striving to win the ball back as soon as possible starting from his forward, to play with a slight urgency and directness without playing pointless, high risk balls forward instead remain fluid and attractive all over the field. Goalkeeper: A good shot stopper as well as being comfortable with his feet. 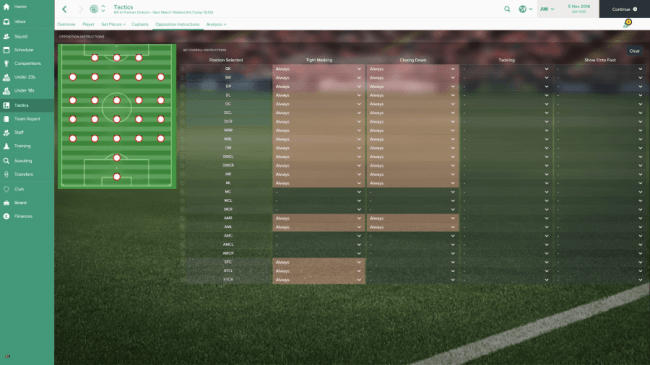 Centre backs: Must be able to keep shape in defense, intercept stray passes and play from the back. 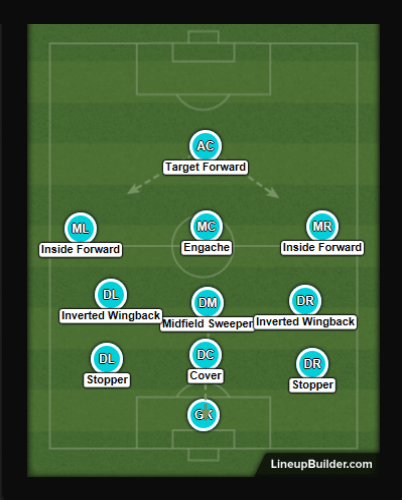 IWB / DM: Must be able to get up and down the field and contribute to attacking and defensive phases of the game, must be able to run out wide and overlap as well as sit narrow and distribute the ball. 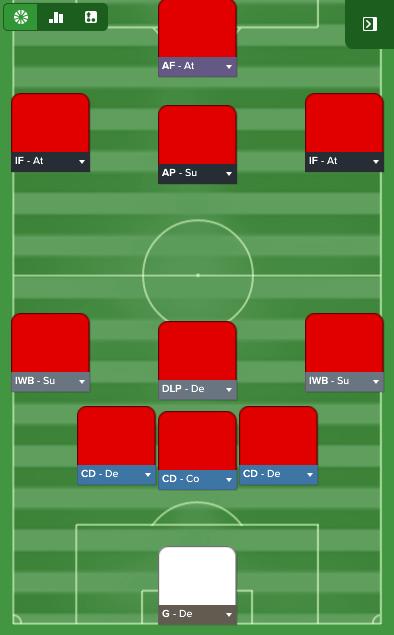 DLP/D: Must be able to sweep up loose balls within own half, win the ball back and play killer balls out wide or over the defence. 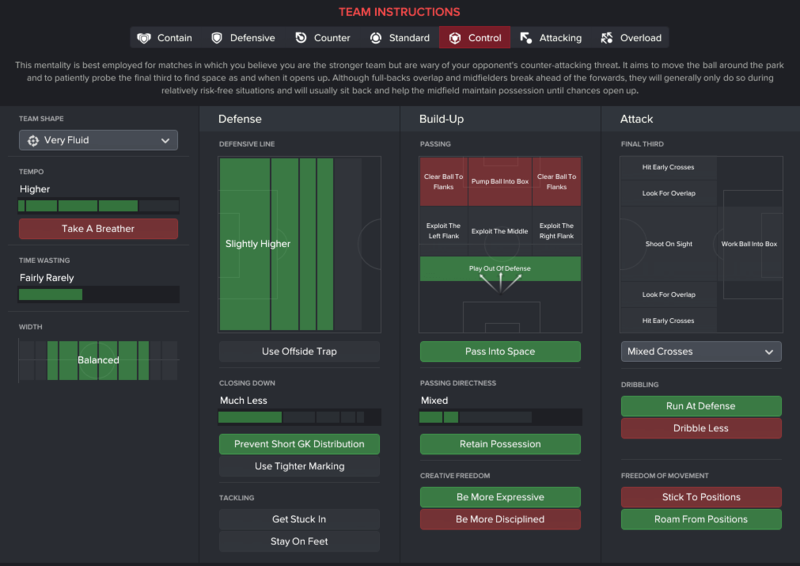 Inside forwards: Both inside forwards are set to stay wide whilst attacking in order to stretch the defense as much as possible, must be able to press, finish as well as fulfill inside forward duties. AM: The creative outlet in the team, a stationery play maker which is responsible for playing the ball through the defense into the forwards, maintaining possession and offering a passing option to other players. AF: The main goal threat in the team, must be able to head, finish, contribute in the build up, hold up the ball and press when out of possession. Here is an example of the high line and high pressing. 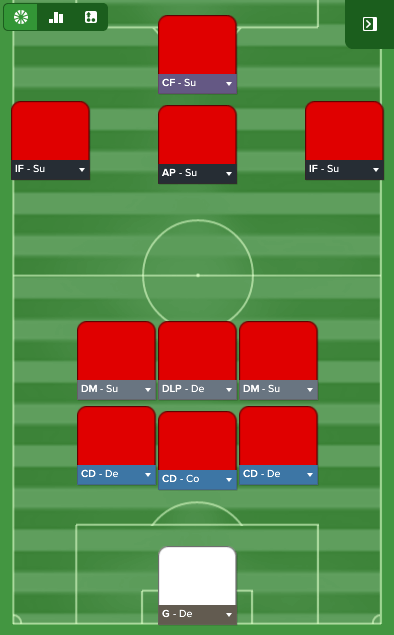 The opposition have the ball from the goalkeeper and have an option to play it long or short, if the goalkeeper decides to play it short our attacking players will press and win the ball back in the final 3rd, of the ball is played long out defence will step forward and sweep it up. Here is an example of the numerical advantage in important areas of the field. 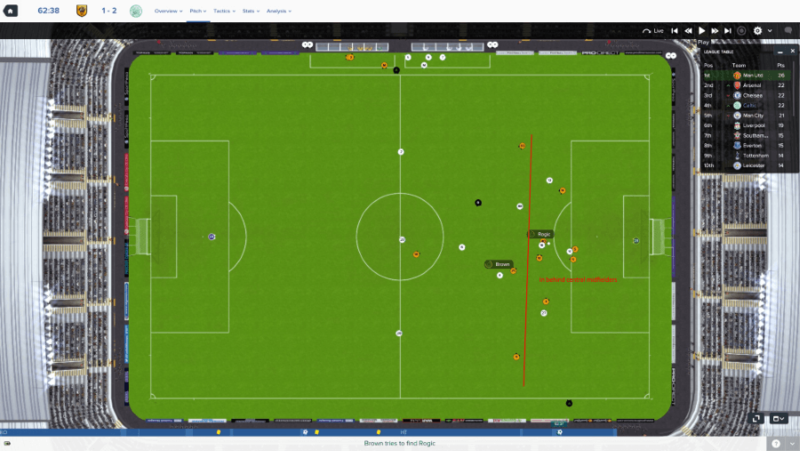 The opposition goalkeeper played the ball long and our defence chased it down and won the ball back, as you can see our team controls the defensive space extremely well at the right time with a numerical advantage in both areas. Here is an example of our team playing a high line and controlling the attacking space, as you can see our players are all in perfect positions to retain the ball and press high up the field if possession is given away. As you can see our LW is completely free and unmarked as our team try to create openings in behind the 4 areas. Here is an example of our team providing a numerical advantage in key areas of the field, the defensive line is as high as possible space is compressed and there are many options to create an opening in behind the central area. Our team has advanced forward with the ball and got in behind the opposition central midfielders, our team is instructed to take advantage as fast as possible without rushing and being wasteful. Our team have managed to shift the ball in behind the defence and put Moussa Dembéle one on one with the keeper which was slotted into the back of the net. So what are the three version for, what do you do with each?